It started about three or four years ago: Holly suggested we raise chickens. I scoffed. But in the last year or so, Holly got Kennedy on board and now here we are with a chicken coop in the backyard. 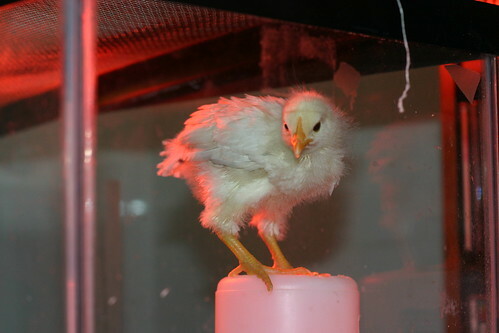 When we first got the chicks at Easter, they were mighty cute. They were just two days old and would wander around in the tank under the heat lamp, occasionally nodding off and tilting over, like little junkies in the park. Now they’ve more than quadrupled in size. Holly says some of them might get twice as big as they are now. The tank we’ve been keeping them in is too small. They squawk and whistle and battle one another. Holly says they need the heat lamp for eight weeks—early June. 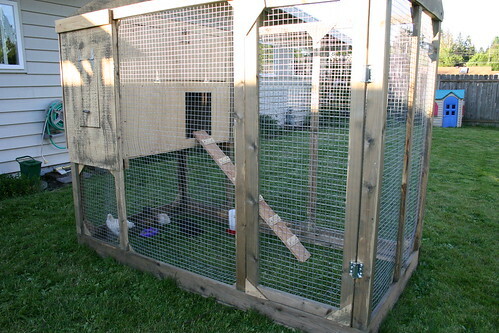 Despite this, I built the coop over the last two weekends, and we’ve been putting them inside it during the day. I’m waiting for the material for the coop roof to be delivered, so for now there is no roof on the coop. You have to hope a hawk doesn’t swoop down and grab one the peeps. Any roosters in the lot? And do you like eggs. You’ll get an egg a day from each hen . . . I’m sure you know this. Looks like fun, though. You’re giving me way too much credit. I know very little about raising chickens. For instance, I had no idea how many eggs we’d get per bird. One a day seems like a lot of eggs! Someone told me we probably won’t get our first egg until sometime this winter, possibly December or so. We have four birds: Kathy (Americana), Quack (Buff Orpington), Bob (Cuckoo Moran) and Shirley (Delaware). Kathy may very well be a rooster, but it’s too soon to tell. They’re not even 8 weeks yet. 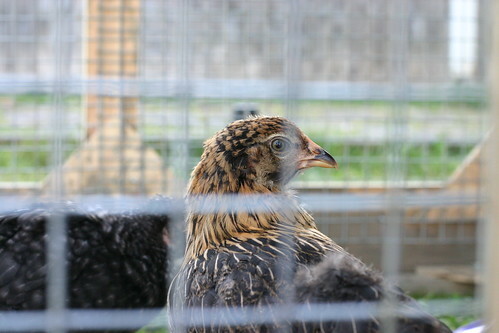 But she’s a very butch hen and seems to have a different warble from the others. We’ll see! Any tips, I’d love to hear. Have you raised chickens? My husband raised chickens at one time, and we’d just been talking about it. Seems simple enough in many ways–a safe place to roost, room to get out and scratch, food, water . . . The eggs come when they mature, and you may not get many during the winter months unless you provide a light source–tricks the biorhythms, I guess. They’ll lay with or without a rooster, but if Kathy turns out to be Kit Carson, he’ll have his way with the hens and the eggs will be fertilized. Fertile eggs can be eaten–early on. Bruce’s son had a little egg route when he was little. But when the hens stopped laying they became friccasee.(sp?) He said now that you’ve named them, a chicken dinner will be tough.